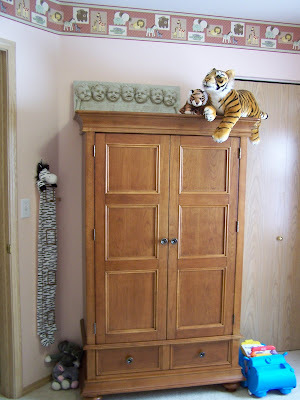 First - I have to thank Jim, my brother-in-law, for helping me set up this Blog to begin with. I couldn't have done it without him - no really I couldn't!! 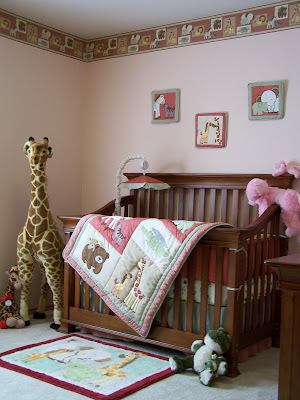 I'm now going to try to upload pictures by myself, so I figured the best ones to attach are of the nursery. I'm not sure where on the page the pictures or the words will end up but lets see (for anyone who knows me - you know that if I'm willing to take on some new computer skill by my self than I must REALLY want this child.) Here we go!?! Well, I couldn't figure out how to write under each picture and I'm not sure why two of them are next to each other or how to download more than one at a time but they are on here so that's what is important. 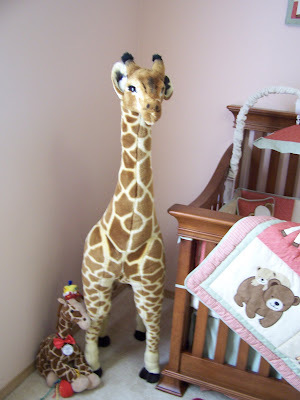 FYI - Stretch is thanks to Grandma and baby Stretch was a gift from Cody, Brooke and Mackenzie for my birthday last year, so thank you all for the babies first stuffed animals. The little rocker is thanks to Mommy (I can't believe that will be my name soon) because it was way too cute to pass up. The walls are a very light peach (not pink) which is hard to tell from the pictures, sorry. The bedding set is called "Mommy & Me" with each baby animal with it's Mommy. 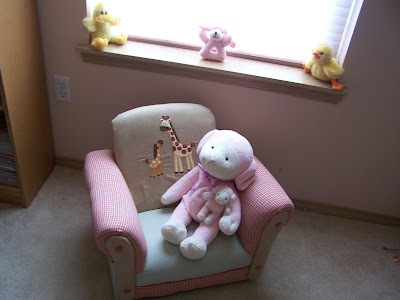 So all the stuffed animals have the big and little ones together. Aren't we cute? Most of the rest of them are courtesy of Grandma, Aunt Angie & Uncle Jim and Aunt Yin-Yin that I got for the baby's first Christmas 2006. Oops I guess she missed it but I hope to make it up to her this Christmas. 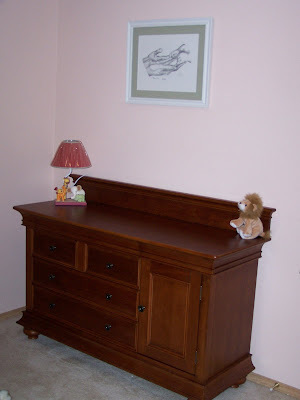 I got the furniture at Baby's R Us (can you still buy stock in the company? I figure I should see some kind of return on my money!) I have to thank Jules & Lisa for helping me pick it up (that was a great lunch on the way to get it), Jules & Dave for helping me get it out of the truck (okay so you two got it out but I directed you to just the right spot) and new daddy Andrew for helping me get it up the stairs. If not for you all, the nursery would have been set up in the garage and I think that's against the law. 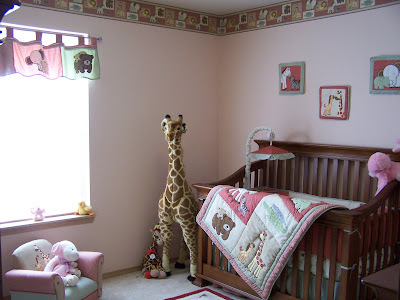 So anyway, the baby has a great new room to come home and mess up. Thanks!